Mistletoe is an evergreen parasitic plant, found growing on the branches of trees. It forms pendent bushes, 2-5 feet in diameter. The genus Viscum has thirty or more species, but this variety of Mistletoe is found throughout Europe. 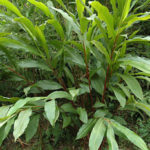 It has a long history of use as a medicine, but is also highly toxic in large doses. Please read the full materia medica, including the cautions, and do not use this herb without the guidance of a qualified practitioner. Energetics: warming, drying; taste is slightly sweet, acrid & bitter. Viscum has been beneficially employed in epilepsy, hysteria, insanity, paralysis, and other nervous diseases. It stimulates the production of oxytocin and is used to restrain postpartum and other uterine hemorrhages and for amenorrhea. It is also reputed a heart tonic. According to Dr. Tascher, it is a remedy for cardiac hypertrophy and dropsy (edema), associated with enlarged heart. Mistletoe was at one time supposed to have properties resembling digitalis, and has been used in the treatment of cardiac and other dropsies; also in albuminuria and arteriosclerosis. In reality it has a depressant action on the heart (unlike digitalis), and it is said to lower arterial tension. The berries are purgative and emetic, and are said to have emmenagogue and ecbolic properties when given in large doses. Its principal action is to depress the nervous system, especially the medulla. Greek physician Hippocrates and 17th century herbalist Culpepper both prescribed Mistletoe for disorders of the spleen. Native Americans used it to induce abortion and stimulate contractions during childbirth. American 19th century eclectic physicians, recommended it for epilepsy, typhoid fever, menstrual cramps, and postpartum hemorrhage. Rudolf Steiner reintroduced the use of mistletoe extracts for the treatment of cancer in 1916. It is currently used in Germany as a complimentary treatment for cancer. 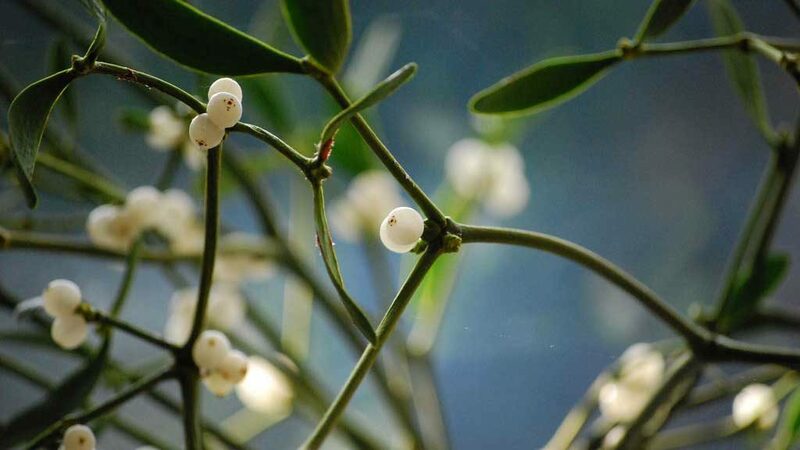 Mistletoe has been found to have cytotoxic activity against cancer cells in vitro. In vivo, mistletoe has been shown to increase quality of life for people undergoing cancer treatments. It seems to stimulate immune activity and increase angiogenesis (the growth of new blood vessels). See the reference at the bottom for more information on mistletoe and cancer treatment. Specific Indications: flushed face, recurring headache; tearing, rending rheumatic or neuralgic pains, coming on in paroxysms; weak, irregular heart-action, with dyspnoea, cardiac hypertrophy, and valvular insufficiency. Cautions: This plant possesses toxic properties. Vomiting, catharsis, with tenesmus and sometimes bloody stools, papillary contraction, muscular spasm, prostration, coma, convulsions, and death have been reported from eating the leaves and berries. This herb should only be used under the guidance of a qualified practitioner. Shakespeare calls it ‘the baleful Mistletoe,’ an allusion to the Scandinavian legend that Balder, the god of Peace, was slain with an arrow made of Mistletoe. He was restored to life at the request of the other gods and goddesses, and Mistletoe was afterwards given into the keeping of the goddess of Love, and it was ordained that everyone who passed under it should receive a kiss, to show that the branch had become an emblem of love, and not of hate. *This month I cheated a bit and used someone else’s mateira medica. This information is paraphrased and excerpted from the Belfast Herbalist at http://belfastherbalist.blogspot.com/2011/12/miseltoe-monograph.html. 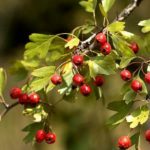 There is a lot more information about mistletoe on this website, including research. Please check out her page to learn more and see her list of sources.